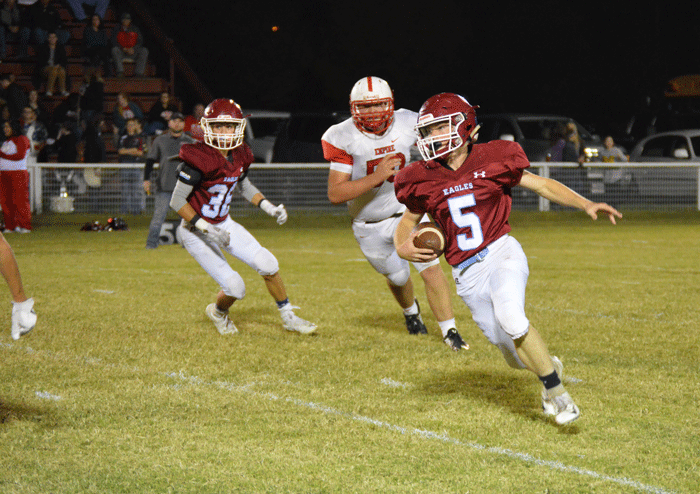 In was a slow start for the Waurika Eagles last Friday night in the second round playoff contest with Cherokee, but the Eagles broke loose for a 58-14 win over the Chiefs with the aid of five Cherokee interceptions. Waurika will hit the road for the quarterfinal round. The Eagles travel to Davenport on Friday. Kickoff is set for 7 p.m. The Eagles had a few turnover problems, too, as the first two Eagle drives ended with a fumble and an interception. Turner Mora looking for an open receiver. 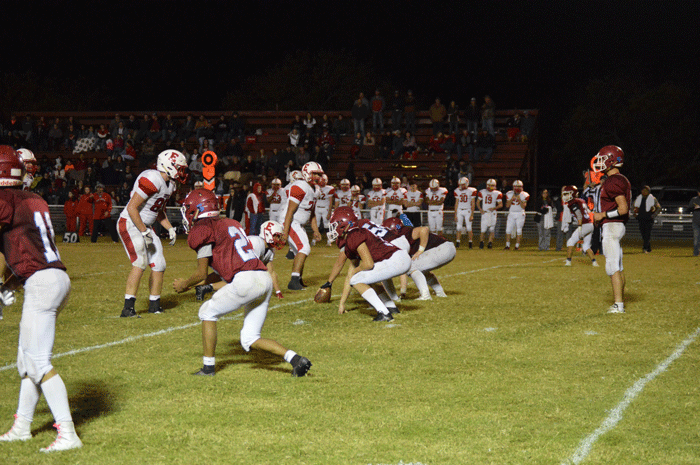 But the Waurika defense held its ground and forced Cherokee to punt on its first two offensive thrusts. 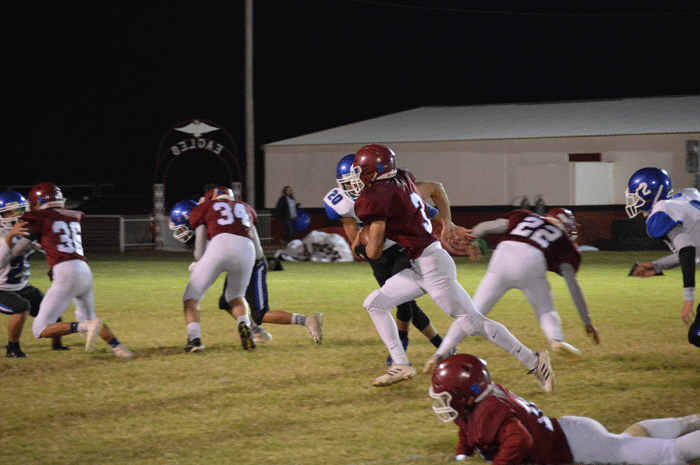 After the second punt, the Eagles took the ball at the Waurika 18 and marched 82 yards in just eight plays for the first score of the game. 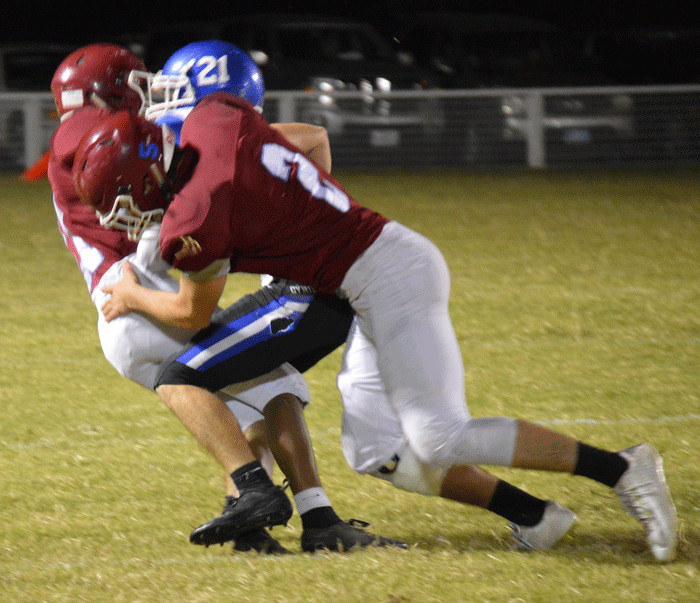 Turner Mora connected with Aaron Nitka and Hunter Wesberry on two big pass plays to help the Eagles advance down the field. Kevin Garcia racing toward the end-zone. Zac Brown capped the drive with a six-yard run and Colton Bryant ran for the two points to give the Eagles an 8-0 advantage with 1:40 left in the first period. Cherokee answered the score after Kade Chace returned the kickoff to the Cherokee 44 yard line. It took the Chiefs five plays to get the game-tying score. On the first play of the second quarter, Chace found 6-8 wide receiver Blake Hall in the end zone for a 12-yard touchdown pass. Chace added the two-point conversion with 11:55 left before intermission. The Eagles were forced to punt on the ensuing series and the Chiefs took over at their own 27-yard line. The Chiefs drove down the field, but on a second down pass by Chace, Waurika’s Wesberry made a diving interception to thwart the drive and give the Eagles possession at their own two. Disaster struck on the first play for the Eagles as they fumbled the handoff and Cherokee’s Damein Labato recovered just inside the end zone for the Chief touchdown. The run failed, but the Chiefs were in front, 14-8 with 7:23 left before the half. This was only the second time this season the Eagles have trailed in a game, but they responded well to the challenge. After a 12-yard kickoff return by Kevin Garcia, the Eagles were in business at their own 48. Overcoming a penalty, the Eagles drove the distance in seven plays with Mora getting the score on a one-yard plunge. Mora connected with Aaron Nitka for the two-point conversion and Waurika was back in front, 16-14, with 4:19 left in the second quarter. Things began to turn south from this point as Treavor Green could not handle a pooch kickoff by the Eagles and Austin Dyer was there to recover the ball for the Eagles. 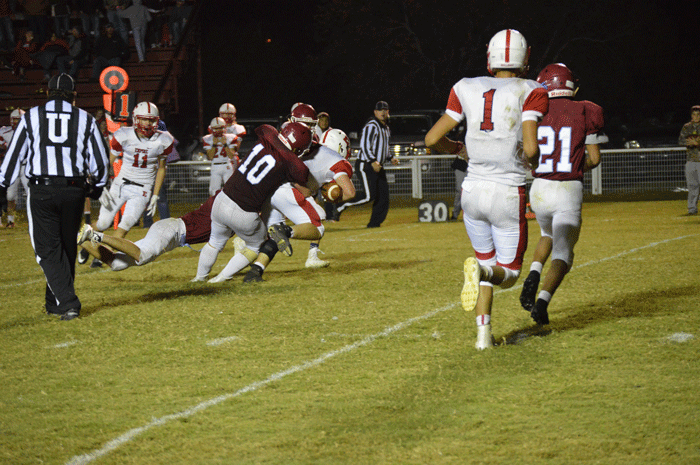 Cherokee forced another Waurika punt, but Payton Ream let the ball go through his hands and Edwin Garcia was downfield for the Eagles to recover the ball. Coach Joe Allen talking with Turner Mora. 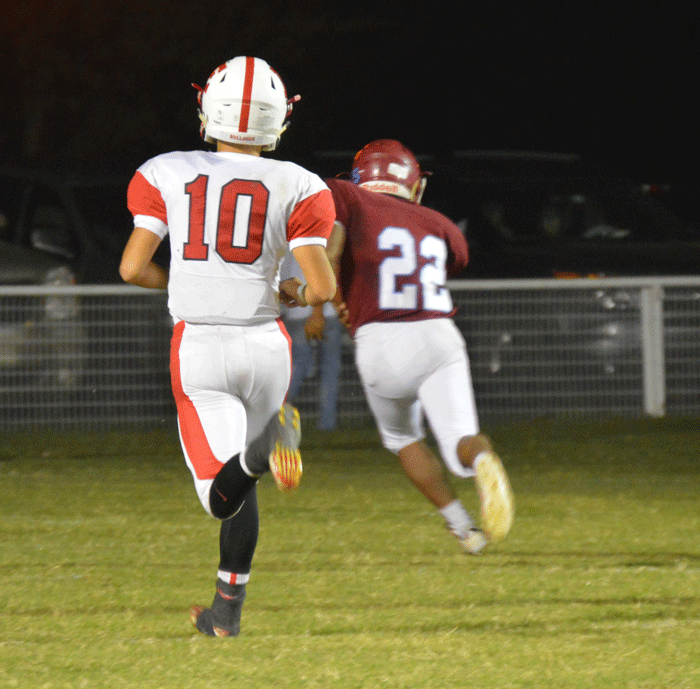 A Cherokee penalty on the play put Waurika at the Chiefs’ seven-yard line and in just two plays the Eagles’ Mora got the score from five yards out. Matt Arriolla ran for the two-point conversion giving Waurika 24-14 lead with 2:21 left in the half. Following a Cherokee penalty on its first play, Wesberry picked off his second pass of the game and returned it to the Cherokee 24 giving the Eagles another golden opportunity. The Eagles covered the distance in just four plays with Mora getting the touchdown on a two-yard run. K. Garcia ran for the two points and with just 40 seconds showing on the clock, Waurika held a commanding 32-14 lead. The second half belonged to the Eagles. 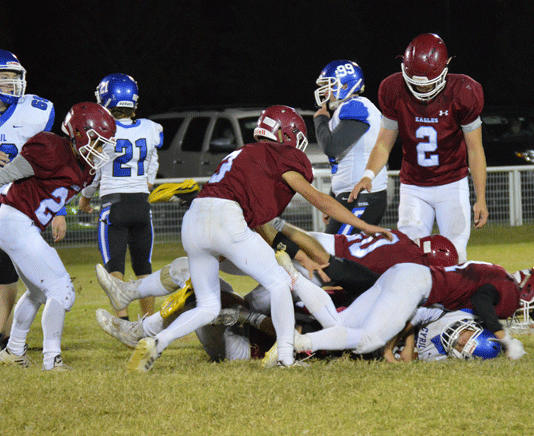 The defense stepped up and thwarted three of the four Cherokee possessions by snaring interceptions. The other possession the Eagles held Cherokee on fourth down. Meanwhile, the Waurika offense continued to churn out scoring drives to dominate the second half. On Cherokee’s first possession of the second half, K. Garcia picked off an errant Cherokee pass and returned the ball 33 yards to the Cherokee 27 yard line. K. Garcia went the distance on first down for the score to increase Waurika’s lead to 38-14 with 9:15 to play in the third quarter. Waurika defensive player stopping a Cherokee runner. The next Cherokee drive also ended with an interception by Mora. 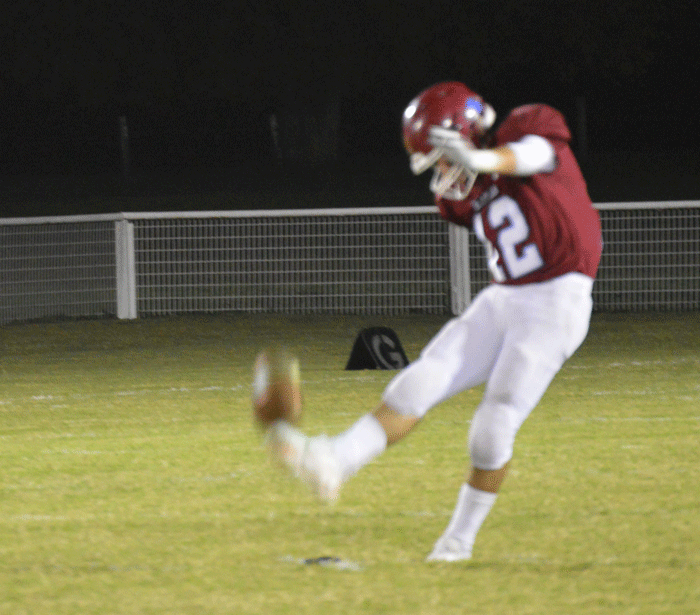 He returned it 23 yards from the Waurika one, but a Waurika holding penalty set the Eagles back to the Waurika 15. The Eagles engineered a 10-play, 85-yard scoring drive and the scoring play was a 22-yard pass from Mora to Nitka. After the two-point conversion failed, the Eagles held a 44-14 lead with 3:12 left in the third quarter. Cherokee was able to pick up a first down on the ensuing possession, but the Eagle defense stuffed a fourth down and short run to take the ball over on downs. This time it took the Eagles 12 plays to cover 60 yards for another score. Arriolla was heading into the end zone for the score but fumbled and Jordan Watkins fell on the loose ball for the Waurika touchdown. Mora ran for the two-point conversion giving Waurika a 52-14 lead with just 7:52 left in the game. On the kickoff, Cherokee failed to field the ball and Mora raced down the field to cover the ball giving the Eagles possession at the Cherokee 28. On the first play, Mora raced 28 yards for the score. The two-point conversion that would have ended the game by the mercy rule failed, but with 7:44 remaining in the game the final margin was established. Cherokee moved the ball to the Waurika 16 on the following possession, but K. Garcia ended that threat with an interception in the end zone and Waurika successfully ran off the final 3:07 of the game to secure the win. K. Garcia picked up 170 yards on 14 carries for the Eagles, while Arriolla, who came in for an injured Bryant, added 105 yards on 11 carries. Wesberry and K. Garcia each had two interceptions for the Waurika defense and that helped limit the Chiefs to only 58 offensive plays compared to Waurika’s 72 plays. After the Chiefs scored their second touchdown in the second quarter it marked only the second time all season Waurika has trailed an opponent….The 58 points scored is the second highest total by Waurika in a playoff game…The 1951 state championship team put up 65 points on Okemah in the state finals that year….The 170 yards rushing by K. Garcia is the top rushing mark for the season by a Waurika player….Mora’s four touchdowns on the ground was a season-high for the Eagle quarterback….It is also the most rushing touchdowns by any Waurika player this season…The 10 penalties whistled against the Eagles is the most this season and the 85 yards in penalties against Waurika is the most yards penalized this season….The 58 points scored by Waurika is tied for the third highest number of points scored in a game in 2018…Arriolla’s 105 yards rushing is also the top mark of the season for the freshman running back…The 374 yards rushing for the Eagles is the most this year and the first time they have topped the 300-yard mark mainly because only two games went the full four quarters during the season. CHEROKEE: Rushing – Chace 18-76, Payton Ream 16-44, Labato 5-12; Passing – Chace 8-17-102-5; Receiving – Ream 3-38, Hall 2-27, Jacob Mustard 2-14, Blaine Hellar 1-23. 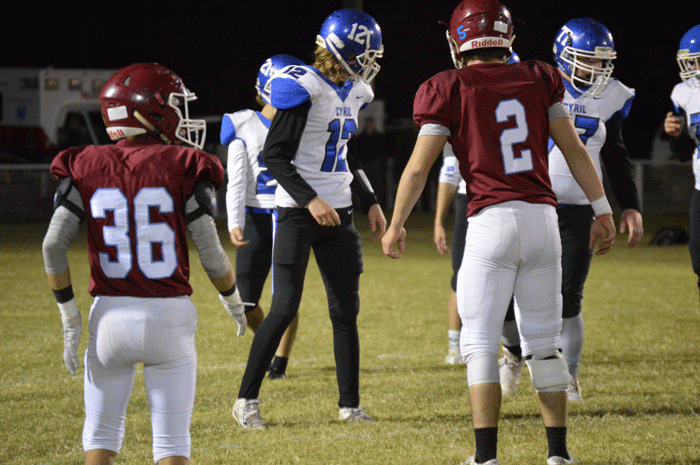 The quarterfinal loss suffered by the Waurika Eagles certainly was hard to take, but it should not take away from one of the best football seasons in school history. Waurika finished the season with an 11-1 record and that mark ties for the fifth most wins in a season for the Eagles. The Eagles were ranked ninth in the final Class B poll by The Daily Oklahoman. The last time a Waurika team finished ranked in the top 10 was in 1997 when the Eagles were ranked seventh in the final rankings. 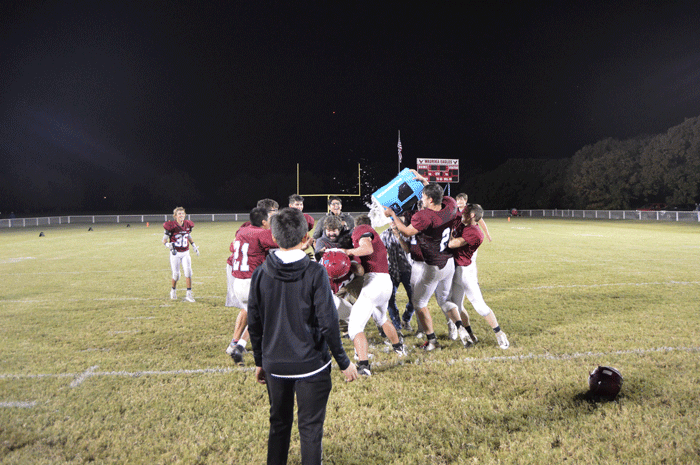 The 11 victories were the most since Waurika put together 12 wins in the 1988 season. Waurika was undefeated in the regular season and that has happened only five other times in the 99-year history of the sport at Waurika. Waurika Cheerleaders, band, and football players at the pep-rally. Not even the state title team in 1951 finished the regular season with an unblemished record. Two of the unbeaten seasons came in 1928 and 1933, which were before the playoff system began in Oklahoma. The records for those two years feature some tie scores in the results. The 1928 team finished 7-0-5 and in 1933 the Eagles were 8-0-2. The 2018 squad claimed the second district title since beginning eight-man play. The season-ending loss in the quarterfinals marked the first quarterfinal playoff appearance by a Waurika team since the 1996 squad defeating Ringling, 14-6, before falling in the semifinal round. In Waurika’s 11 wins they have played beyond halftime only three times. 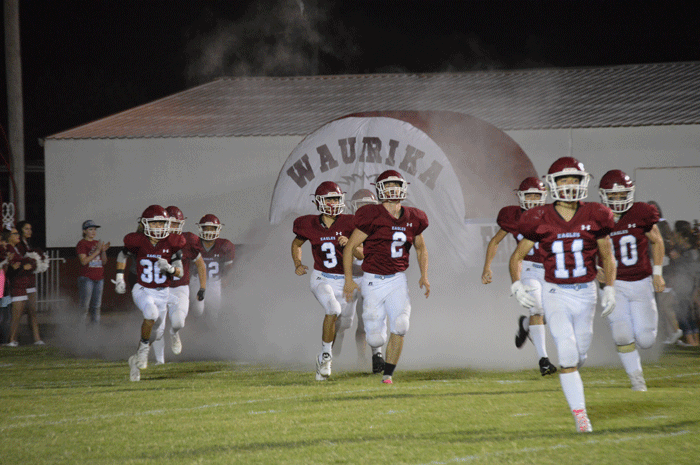 Waurika was involved in a total of 10 games that did not go the full four quarters. The Eagles outscored opponents by an average of 49.3 to 13.3. Waurika scored an incredible 498 points in the first half against their opponents while surrendering only 146 – and 52 of those points came in the loss to Davenport. Opponents only scored 14 points in the second half against the Eagles, but that is mainly due to most games ending at halftime because of the 45-point mercy rule. Certainly, the 2018 squad coached by first-year mentor Joe Allen accomplished a great deal. But, there were also some outstanding individual performances during the season. Turner Mora was outstanding directing the Eagle offense from the quarterback slot. The talented junior signal-caller finished with 24 rushing touchdowns, two kickoff returns for scores and 18 two-point conversion runs for a total of 192 points during the season. He also threw 12 touchdown passes during the season. Colton Bryant, a senior running back for the Eagles was the second leading scorer on the team. He rushed for 15 touchdowns and had three touchdown receptions. He also returned three interceptions for scores and had 20 two-point conversions. The longest run from scrimmage for a score during the season came in the Eagles’ critical win at Wilson. Zachary Brown raced 80 yards for a score to top the list of long-distance touchdown runs. Bryant and Mora also had long scoring runs. Bryant had a 78-yard run against Grandfield, while Mora scored from 71 yards out against Bray-Doyle. 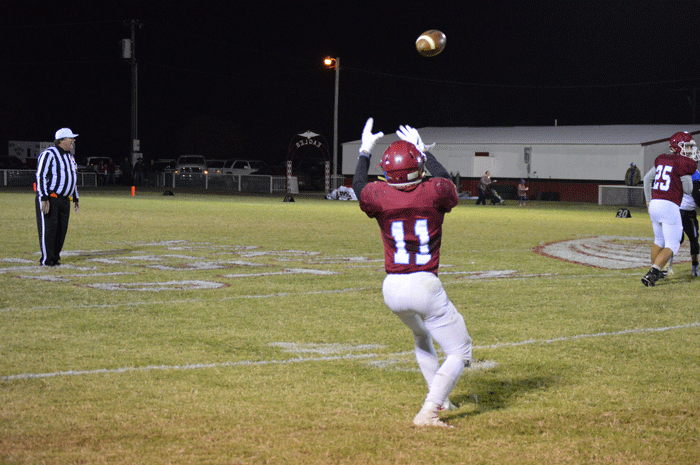 The longest scoring pass play came against Central High when Mora connected with Hunter Wesberry from 44 yards out. The Eagles had only two kickoff returns all season and Mora had both of those. A 75-yard return against Carnegie was the longest of the season. Bryant’s 50-yard interception return against Ryan was the longest of three interceptions returned for a touchdown and Bryant had all three of them. 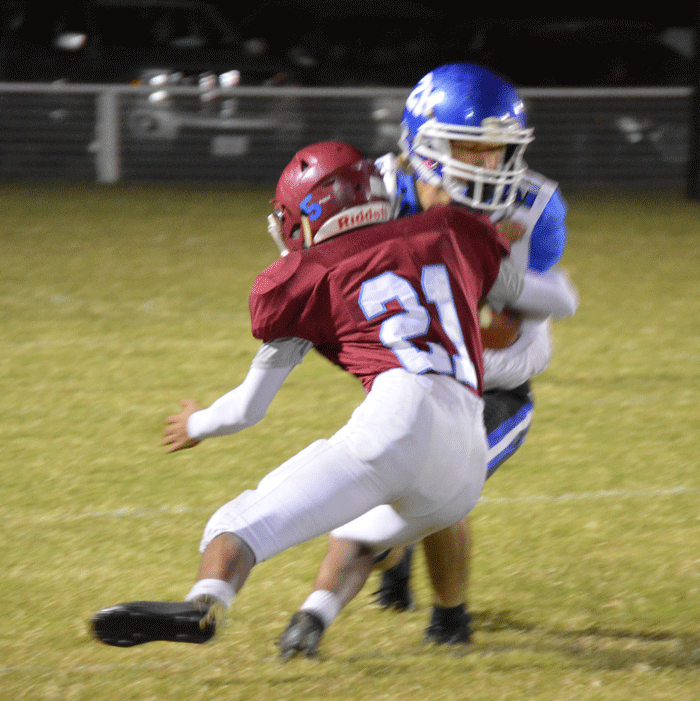 Waurika returned five opponents’ fumbles for scores. Edwin Garcia’s 55-yard scoop-and-score against Caddo was the longest return of the year. The Eagles will try to build on the success of the 2018 campaign next season and will have seven returning starters to help provide some stability for the 2019 squad, which will likely be tabbed to repeat as district champions. Cy Sloan Stadium will continue to be the place to be in Waurika on Friday night as the Eagles take on Cherokee in the second round of the Class B playoffs. Waurika will be looking to advance to the state quarterfinals for the first time since 1996 when they play host to the Chiefs. Waurika advanced with a 48-0 victory over Cyril in the first round, while Cherokee earned a second-round playoff berth with a 36-16 victory over Turpin. Much like the Eagles, the Chiefs have exceeded expectations during the 2018 season. Cherokee was tabbed to finish third in District B-2, but earned the runner-up spot in the district after falling to Pioneer-Pleasant Vale, 58-40, in the final regular season game. The Eagles were picked to finish third in District B-4, but rolled through the district competition to claim their first district title since 1988. Waurika scored mercy-rule victories over every district opponent except for Wilson. The third round will be tougher for the team that advances from this encounter. The winner will take on the winner of Davenport and Weleetka. Davenport, 11-0 on the year, is ranked second in Class B, while Weleetka, with an 8-3 mark, is ranked eighth. Records: Cherokee is 7-4 on the year and was the runner-up in District B-2 with a 4-1 mark in district play. Waurika is 10-0 and was the champion of District B-4 with a 5-0 record. State Rankings: Waurika is ranked ninth in the Daily Oklahoman’s Class B poll, while the Chiefs are unranked. Coaches: Bryce Schanbacher is in his 11th season at the helm of the Chiefs and has a 96-52 mark with eight playoff appearances. 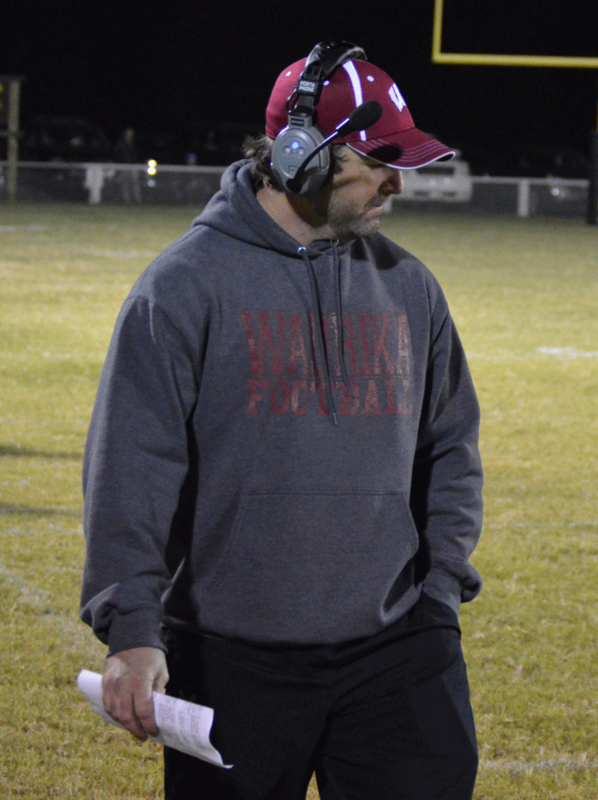 Joe Allen is the first-year mentor for Waurika and has not lost in 10 games in 2018. Playoff History: Cherokee is in its 20th appearance in the playoffs with 12 of those coming in eight-man competition. The Chiefs have compiled a 19-17 mark in the playoffs and have won state titles in 2013 and 2010 when the Chiefs competed in Class C. The Chiefs also were state runner-up in 2014. The Chiefs missed the playoffs in 2017 ending a seven-year streak of qualifying for post-season play. Waurika is in its 28th appearance in post-season play and the fourth time in eight-man play. Waurika has a 27-25-2 playoff record and one state championship in 1951. 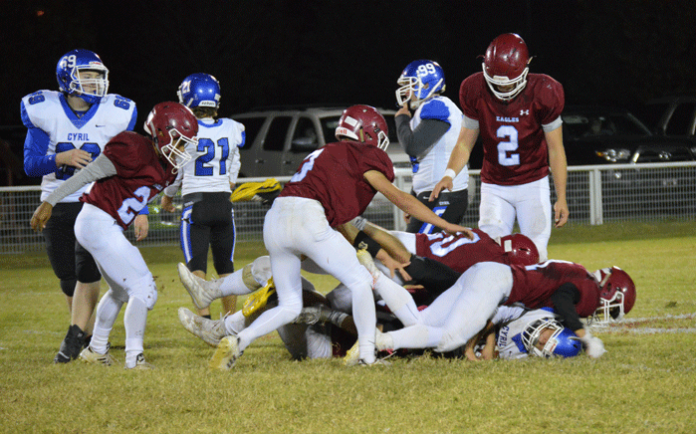 The Eagles earned their first district title in eight-man competition this season. Waurika will be looking for its 10th quarterfinal appearance in the playoffs win a win against Cherokee. 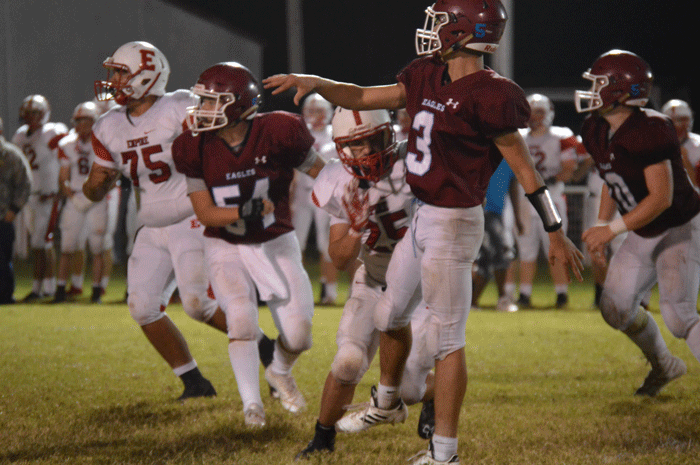 Team Capsules: Cherokee features a one-two punch on offense led by quarterback Cade Chace and running back Payton Ream. In the team’s win over Turpin, both players rushed for over 100 yards with Ream getting 112 yards and Chace finishing with 146 yards. Both scored two touchdowns in the game. Chace has been splitting time with Rustin James after the starting quarterback suffered a season-ending injury midway through the season. Ream had 124 yards in a loss to Pioneer-Pleasant Vale on the final night of the regular season in a game that settled the District B-2 race. Ream had five touchdowns, rushed for 262 yards and had 131 yards receiving in a wild 82-48 win over Kremlin-Hillsdale. Chace had all three scores in a tense 18-12 overtime win over Ringwood in week nine. The Chiefs are averaging 34.9 points per game on offense, but are surrendering 32 points a game. Cherokee racked up a season-high 678 total yards in the win over Kremlin-Hillsdale. The Chiefs have won five of their last six games. The Eagles continued what will no doubt be one of the greatest seasons in school history with the first-round playoff win over Cyril. Waurika has the advantage as the district champion of hosting for the second round of the playoffs. 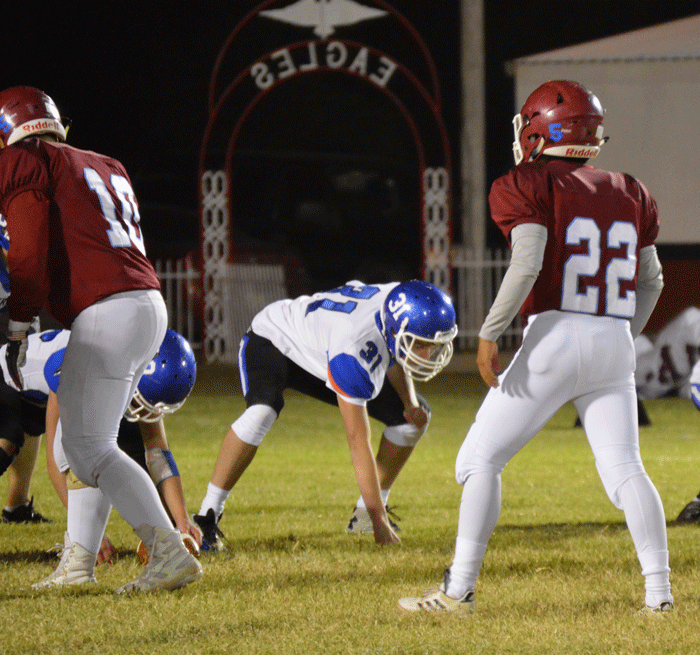 If you are looking for impressive numbers by the Eagles, they are scarce because Waurika has ended its games early in nine of the 10 games making it difficult to compile any impressive statistics. Waurika played into the third quarter for only the third time in 2018 against Cyril. Turner Mora, Colton Bryant, and Zac Brown will be counted on in the running game, but Kevin Garcia had one of his best games last week in the first-round victory over Cyril. Aaron Nitka has been a favorite target of Mora when the Eagles have gone to the air. The Eagles have played beyond halftime only three times in 10 games. The Eagles are averaging an astounding 53.4 points a game while giving up only 4.2 points a game. Outlook: Waurika must come up with another outstanding defensive performance similar to last Friday’s impressive performance against Cyril. But, the Eagles have been dominant on defense most of the year. It should be strength against strength as both teams have been able to score lots of points throughout the season. 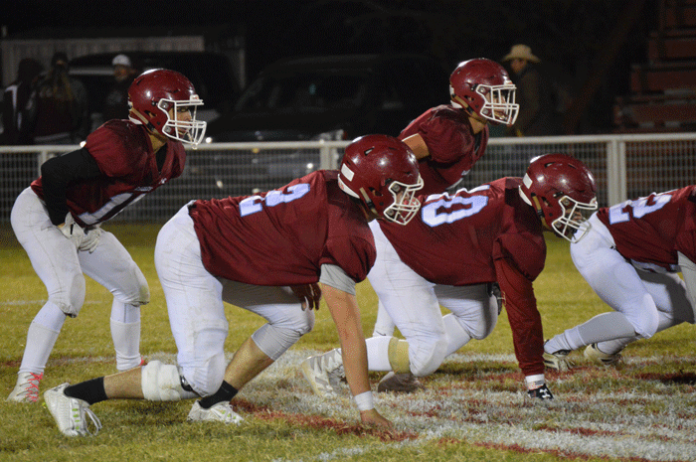 The Eagles’ quickness on defense should be the determining factor and if Waurika is prepared to handle the offensive onslaught of the Chiefs, they should move on to the quarterfinal round of the Class B playoffs.